There's a good chunk of black video at the beginning. Just be patient for the action. awesome test Micheal! Really interesting results I'm curious how that would be with a spring steel harness...though I think the main issue was having you're arms fully articulate with your strokes. Don't know many people that would be willing to do that with their armour The entire time I was watching that I was thinking "ohh...that's gonna rust"
The armour was rusting before I was out of the water. Something in the pool water caused it to oxidize it in 20 minutes. The armour still has many hours of work before it's back to normal. One thing that didn't make it into the final cut of the video was me weighing the harness. It's a lot lighter than I thought, around 50 pounds. The only thing the arms prevented me from doing was a proper breast stroke. I liked your video Michael very much, I'm not much of a armor guy, I prefer 16th & 17th century where armor was on the decline and maybe you'd find a small kit if that. Impressive sacrifice for the community! Lake or river water would have been kinder to the armour, but it would also have been much more dangerous to do these tests in natural environs, so pool water was probably the better option. Thanks you for the work you put into posting this research. I always enjoy when results are shown practically and not speculated upon. This is a good contribution to the community for a frequently asked question. As JE wrote: Good work! Very interesting video! Wonderful experiment, Michael! The next question concerns the speed with which a panicked man can strip off enough plate to get to the surface and swim to shore. That was great. Well done, and thanks. Micheal, thank you so much for that incredible video. That lays to rest some questions I had about swimming and armour. I admire you for taking the time to do this. Very good quality video. 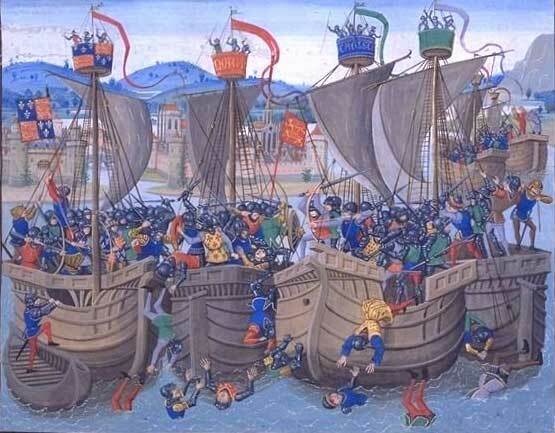 I also have to admire the soldiers who wore armour in naval battles. It gives me even more respect for them. Better to be stabbed to death or drowned? It's quite a choice, isnt' it? Some of my name were naval archers for Henry V, and this research is making me think about them--and other ship-bound soldiers--in a new way. Way to take one for the team! I’d be interested in knowing how many hours of armour polishing was required after your test. The next question concerns the speed with which a panicked man can strip off enough plate to get to the surface and swim to shore. Wow, that’s a tough question to answer without some degree of speculation. I don’t believe we can ever “go back in time” and truly replicate a drowning, panicked man in armour as shown in your illustration. Michael wisely had several safety divers with him and was working in a very controlled atmosphere. It’s my understanding that the average medieval man was, in general, not a strong swimmer. Many superstitions and fears were associated with the ocean and those darn “sea monsters” took down their share of vessels. The most expedient method would be cutting straps and points. You’re not going to take the time to unbuckle and untie, you want out NOW. The drowning individual must have a knife / dagger readily accessible and be cool-headed enough to use it. As a former lifeguard and current scuba diver, I’ve been fortunate to have encountered panicked individuals only once. We were boating off the coast of Cozumel, Mexico when our captain spotted two bobbing heads way off in the distance. These two divers had become separated from their group, swam to the surface, inflated their BCD’s, and started signaling to every passing vessel. While they were in no immediate danger of drowning, their long term situation was grim had they not been found. They were European, but unfortunately did not speak Spanish or English. Through hand gestures and common words our captain was eventually able to reunite them with their cruise ship tour group. The look in their eyes as we pulled them aboard and their incoherent chattering (common to every language) sent chills down my spine. They were in full-blown panic mode for at least another 15 minutes after boarding our boat. Scuba and lifeguard training programs consistently show that drowning individuals almost universally cling to you and inadvertently take you down with them. I assume much would be the same (or worse) for a medieval man who is uncomfortable in water and wearing armour. It’s my understanding that the average medieval man was, in general, not a strong swimmer. The average sailor in the British Navy during the Age of Sail did not swim either. If the ship sank, the majority of the crew went down with it (unless they had enough life boats). And they weren't even wearing armour. Michael, Congratulations! That was an amazingly gutsy thing to do! I wouldn't have expected a man in armor to be able to do anything other than sink like a stone. You have shown that someone could, at least, swim a short distance. thank you for poasting your test it was very informative. however i have heard of a man who swam across the nile river or some outher river in egipt close to it (it has literly been years since ive read about this) the man who swam across the river wore full plate armor, and even acording to some vareations of the legand he had heavy weights straped to his legs and arms. just thought id informe you of one single legand ive heard of to intrest you. thankyou once again for poasitng your test. If i can remember where or how i heard of this legand i'll PM you. The armour was rusting before I was out of the water. Something in the pool water caused it to oxidize it in 20 minutes. . It was the chemicals in the pool water to keep it stable for human use. Pools are balanced at 100 PPM total Alkalinity, 3-6 ppm chlorine, 7.2 pH in Anchorage and they use a witches brew of chemicals to keep that balance. If there was a strong chlorine smell that day, the combined chlorine count could have been as high as 10 ppm in a unsafe, unbalanced pool. I knew going in that my armour would be damaged. I did it in the pool for the safety, it was a compromise I was willing to make. If I owned a coat of maille I would be happy to try, but I think that walking would work, but swimming would be impossible. So much heavier, and a lot of drag. Flowing water, going WITH the water, may aid in the movement and swimming, if it wasn't too fast. I don't know. I personally can't get a lot of my armour off without help. I can get my helm, gauntlets, and probably my some other peices off, but I don't know how many. I also had a tie point snap while underwater, so that may aid in shedding. I would just try cutting stuff off with a dagger if I had a clear enough mindset. Great work, though I have to wonder what it would be like to get Michael Phelps in a similar situation. I wonder if someone who was fairly strong&fit and was used to wearing armour for long periods would have been able to handle the water more easily. Also if they also used partial harnesses (i.e. no leg or rear protection) and the total armour weight was only 20~30 pounds then perhaps they would have had a better chance both getting out of their armour quickly and/or swimming to a nearby boat or shore. it was a very interesting video and I like that you came off looking both professional and well spoken. Thank you for the effort you put in to it.